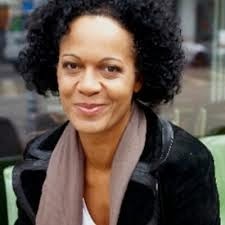 Asumang — who is half-German and half-Ghanaian — came into the public eye during the 1990s as one of the first black women on German television. More recently, the actress and presenter became the target of right-wing extremists and neo-Nazis simply for being a person of color on television. One particularly jarring threat came via song — a track titled “This Bullet Is For You, Mo Asumang” by the German white-power band White Aryan Rebels. But instead of shying away from her attackers, Asumang decided to confront them directly. “I thought, ‘Who are these people? How do they react when they meet me?’" she says. She filmed those confrontations as part of an upcoming documentary called "The Aryans." The title references the attacks against her, which are based on her “non-Aryan” identity. But Aryan is a problematic title — one that Asumang says was co-opted by the Nazis to describe the “master race.” Historically, she says, it’s not a white identity at all. “I just wanted to find out, what are Aryans? Because nobody ever questions this," she says. "Everybody thinks it’s tall, blond and blue-eyed — what the Nazis told us in the Nazi times."